Summer Offer – Stay over summer and save up to 45% off the room rate. Please contact us for further details. 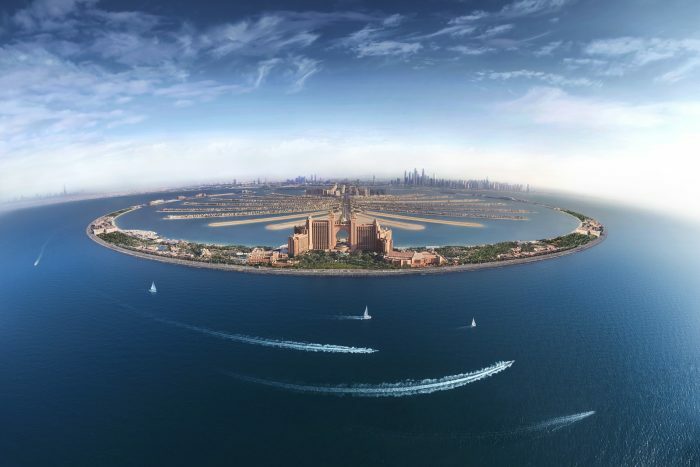 Atlantis, the Palm is monumental to the Dubai Skyline. Located on the Palm and an architecturally great achievement, guests are introduced to oversized, extravagant luxury upon arrival. A resort of discovery and excitement, every moment spent at the Atlantis will be memorable and opulent. Guestrooms are located in the Royal Towers and each is touched by hints of Arabia and the ocean. Overlooking the Arabian Sea or the wonder that is the Palm are just some of the splendour of your view from your guestroom. Designed with guest’s relaxation in mind, guestrooms are spacious and full of luxurious comforts, which embody the soothing attributes of the ocean. Aqua venture Waterpark and The Lost Chambers Aquarium are adventure filled, fantastic ways to spend the days. Visit Dolphin Bay and swim with dolphins or dine at one of the incredible restaurants, there is much to be enjoyed at the Atlantis and guests will find no reason to leave the resort. Summer Offer – Stay over summer and save up to 45% off the room rate & a complimentary upgrade to Half Board on selected room types. Tranquil indulgence is laid bare at ShuiQi Spa. 27 treatment rooms are available, offering serene environments and relaxing treatments. Try a water therapy and be amazed by how revived you feel after. N’Dulge Nightclub – A hip place to hang out, the nightclub is brought to life by resident DJs that play upbeat tracks from around the world. Barazura – A lounge bar that is magnificently decorated with eclectic shade of blue makes for a cosy and stylish venue to enjoy cocktails and wines and be serenaded by a pianist. Marine Animal Adventures – Whether ray feeding or interacting with dolphins, shark snorkelling or a shark safari, the amazing experiences at Atlantis are unforgettable. KIDS CLUB – Catering for teens and children, each day has different experiences and the younger Atlantis guests are kept thoroughly entertained. Arts and crafts areas are colourful and energetic; a dance club for partying away and climbing walls are just a few of the activities on offer. Boasting two large swimming pools, relaxing by the pool is peaceful and relaxing. Extending the water adventures, go diving and explore the underwater world and go for a banana and donut ride. Wakeboarding and paddle boarding are just some of the fun to be had. Deep sea fishing and desert safaris are readily arranged by the Atlantis. Play beach volleyball or football in the Arabian heat or have a game of tennis on one of three floodlit courts. Atlantis, the Palm is an iconic resort designed for honeymooners to unpack their luggage and not have to leave. Royal Towers form the residence of any honeymoon and guests are enthralled by the beauty of the island. With a hollow dome as its centrepiece, the endless views of azure Arabian Sea are mesmerising and you enter a tropical ecstasy. Guestrooms have been designed to create an alluring and romantic retreat for honeymooners. Indulgent in luxuries, many moments will be made on the private balconies at the Arabian Sea glistens afar and you are in seventh heaven. Whether you want to relax by the pool or in the Sea, there are many places for blissful relaxation. Lush gardens line the Atlantis and guests can share intimate moments along the way. For some thrill seeking moments, swim with the Dolphins or take in the underwater marine life that calls Atlantis, home. Atlantis The Palm is located on Crescent Road, The Palm, Dubai, U.A.E. Levantine – Authentic Lebanese food is rich in flavour and infused with spices that will make your mouth water. Levantine will leave you astounded as belly dancers parade around you as you dine and shisha fills the air. Rostang – A French fine dining brasserie. Parisian dishes and fresh seafood is served as guests dine, overlooking the Palm Island.